Market Sentiment Watch: Welcome to 2Q13. In energy land expect news flow to begin to pick up again prior to 1Q13 reporting season with a string of spring time conferences and with the quarterly mark to market season in full swing now for analysts as they update their models (especially on the natural gas side). In today's post please find comments on the natural gas macro (weaker production, strong demand for January (and a record level for the Industrial component)). Friday 4/5: nonfarm payrolls, unemployment rate, trade gap, consumer credit. Crude oil (WTI) closed up 4% last week at $97.23 with Brent rising 2%. Crude was helped by a strong distillate demand number and by a generally record seeking equity market but the weekly numbers were largely a non-event (see The Week That Was section below for more details).This morning crude is trading off slightly. Natural gas closed up 2% at $4.02 on Friday after EIA reported a bigger than expected, almost record sized withdrawal on Thursday. The front month now looks like this and the 12 month strip, which now sits at $4.19 now looks like this on the five year chart. See The Week That Was section below for more comments on storage. On Friday EIA released the latest available supply and demand for natural gas (for the month of January) and in a nutshell, one could use the word "bullish" but read on and we'll just say that things are working according to plan and that we are more "encouraged". This morning gas is trading off slightly on the more shoulder season like mildness of the forecast. Rig Count Watch: You'll see more on this in the slide show below but just wanted to point out that the gas-directed rig count so far is ignoring the now 1 year long rally in natural gas prices and fell to 389 last week, below 400 rigs for the first time this cycle. While the gas directed rig count is less of an indicator due to all the gassy liquids rich wells being drilled this is still a positive for righting the supply/demand imbalance and points to the correctness of recent commentary about $4 gas not really being enough of a price increase to get people to send many net rigs back to work. Wwe say "net" because some rigs will arrive due to some E&Ps having nothing better (oilier) to drill while others with oilier prospect inventories like an EOG are still taking purely gas directed rigs out of the system. By the way, this is not what your average NAM focused oil service company has been predicting. and 125 normal for the week. This week's forecast calls for HDDs to move down to 117 vs 113 normal for this time of year. The Natural Gas Macro - Supply (Production and Imports) vs Demand. Production Watch: January 2013 production retreated to 67.6 Bcfgpd, down 0.7 Bcfgpd from December levels, was also down -0.7 Bcfgpd YoY, and was the second consecutive month of retreat in production. Some of this dip is due to weather related freeze ups especially in some of the western square states but not Texas, the Gulf of Mexico and especially Louisiana (down 18% in the last 12 months!). Total production growth from the Lower 48 U.S. has not advanced significantly in 16 months. See graphs below for details. Imports Watch: More gas being sent out of the U.S. and less coming in has been the trend. 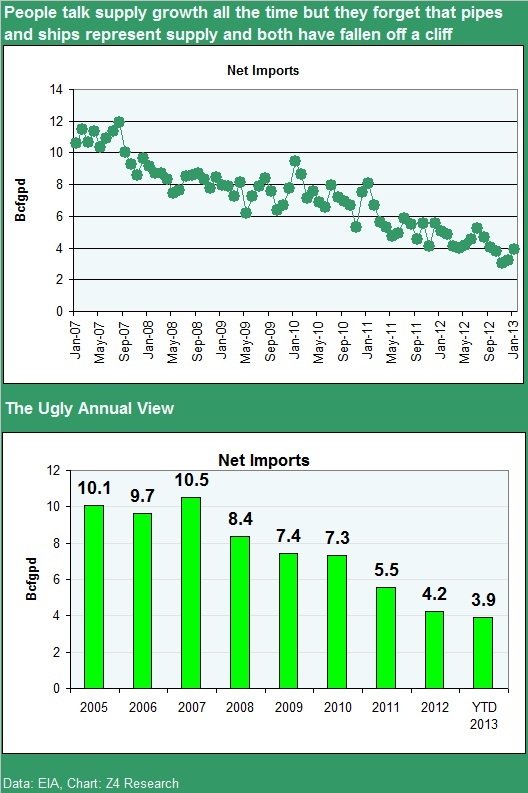 Net imports crept up in January on a seasonal uptick in volumes coming down from Canada but on a year over year basis, imports are off a whopping 1.1 Bcfgpd. See graphs below. Demand Watch: Just short of record levels but second highest gas demand on record. Industrial demand hit an all time record in January and the only reason total consumption wasn't at record levels was due to January's mildness. See graphs below. OEDV - OEDV should report 4Q results today. REXX - As expected, REXX's spring borrowing base redetermination resulted in an increase in the borrowing base from $240 mm to $325 mm with a $300 mm commitment level. At last notice, the credit line remained untapped and cash, borrowing capacity and cash flow pointed to no need for an equity offering this year relative to their current capital program. GST settled its litigation claims with CHK and repurchased it's shares held by CHK for $85 mm. This entry was posted on Monday, April 1st, 2013 at 7:42 am	and is filed under Uncategorized. You can follow any responses to this entry through the RSS 2.0 feed. You can leave a response, or trackback from your own site. BCEI on the tape with a $250 mm senior private placement. The first oil spill came Wednesday, when a train reportedly carrying tar sands oil spilled 15,000 gallons in Minnesota. Also this week, Exxon was hit by a $1.7 million fine for a pipeline that dumped 42,000 gallons of oil in the Yellowstone River in 2011. Notes….Attempting range expansion above 1558.75. 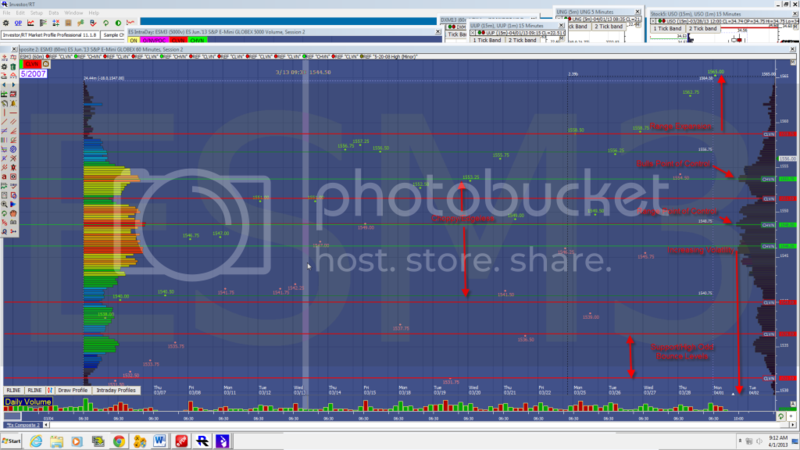 Minor CHVN at 1553.75 Demand volume supportive on all time frames. Breadth trend supportive. POMO supportive through end of April. Risk sectors supportive. O/N Mkts weak, Europe closed. Currencies, $USD consolidating uptrend with Demand Volume positive in all time frames. Range extension above 83.31. Euro Support/Resistance 1.285/1.268. Thoughts ……. Bulls in control above 1353.75. Internals and liquidity remain supportive. Expecting dips to 10 day range lows to continue to be bought. RRC – Global Hunter ups target $3 to $88 but cuts rate from Accumulate to Neutral. Go figure. GST suit with CHK settled. Crude Oil Support/Resistance 96/98 Demand volume positive in all time frames. Natural Gas Support/Resistance 3.87/4.13 Demand volume positive on the daily and weekly time frames, fading on the intra-day. KWK – going to bounce today on Barnett sale announced Friday. No interest by me in chasing. is blotter updated with SDCJF? GMXR filed for Chapter 11. GMXR = Chapter 11 filing. We saw this one coming from a long way off. Not gloating (in the least)… just pointing out what collaborative research can accomplish. re 8 – It is now, thanks. We had two posting glitches this morning. Blotter should show both SDCJF sale and REXX add from last Thursday. re 9 – how not shocking. re 10 – yep, and, sad to say, they really brought that on the move with very gunslinger like strategic shifts. Morning BOP – equity holders over at BCEI should consider doing your happy dance about now. Re GST – yeah, saw that, first thought is $85 mm is no small pill to swallow there. Second thought is I would need to go and have a look to see what I think and 3rd thought is I'm probably just not interested. REXX – RMD noted REXX pulled out of GHS this week. "I hear REXX canceled for next week's presentation at GHS. Financing or M&A anyone?" "They did a senior deal in December. Borrowing base of 240 is untapped and they have cash on the balance sheet as well. Shouldn't be a financing. " John or anyone, do you have GHS schedule? #13 — BCEI shareholders should like this move… a LOT. Smart time to grab some cheap cash combined with operational focus and nicely-ramping production. Natural gas coming off a touch on the warmer forecast. Friday's production and demand numbers were better than expected. Louisiana now coming off faster than "other states" segment can replace it. Everything else a mixed bag, mostly flat, Wyoming and New Mexico are slipping, TX flat, OK up a touch. Meanwhile demand has been very strong. We'll have a natural gas sensitivity piece out for the gassy players a little later this week along with a revised natural gas price deck. PVA management – time to step up and buy your own shares. Re 5 GST $85m price tag worries me. They should be able to cover it with current financing, but it'll be tight. On a positive note, they did acknowledge possibility of selling East Texas assets to help finance the transaction. I had thought for a while they would sell ET assets to pay off prefs, but I guess mgmt has elected to grow the acreage instead. The new acreage in the Hunton should be oily and is right near the SCOOP, which is exciting. I generally like the move mgmt made with the caveat that the price is somewhat scary. ISM = 51.3%, much lower than expected. OEDV plans to report after the close. Talk about a detailed natural gas report. Takes me way back to Economics class perusing elasticity charts . Awesome stuff Zman. Now have to figure out how to make money from this information. re 23 – thanks. The macro is evolving into one that yields better natural gas prices over time. I am slowly upping my exposure to gassier names (and have been for over a year now). The shoulder season typically gets sloppy for prices as we have little in the way of cooling load or heating demand and we could see some large April injections since, although production has come off its highs, it is still relatively very high. I plan to use the sloppiness in prices to continue to add to gassy positions opportunistically and perhaps to take on one more gassy stalwart. COG – GHS cutting to Neutral. Hello short sighted seasonal valuation call. That dip in the natural gas rig count below 400 is not what NAM levered OIH names have been looking for. I didn't buy into the 4Q comments which contributed to runs in names like HAL and CRR. Not going there. Would think BCEI will end up upsizing that $250 mm senior deal announced today to $300 mm or a little more to give themselves some more room. re 28 – right. I measure things via the climate prediction center's heating degree day units and further, into the gas consuming population weighted HDD reading. liking TPLM here. sitting right around Zorg's support level and retest of the recent lows. Then scroll down past normal HDDs, you'll see gas-weighted HDDs and below that, you will see Oil weighted HDDs (heating oil). Note how much bigger HDDs are when viewed in that light (159 vs 117 for the gas weighted measure). re 32 – earnings there in 2 weeks. Ramping to 3 operated rigs shortly thereafter and activating in house frac spread #2 around mid year. Should be another eye pleasing report. Zorg – how do volumes look to you for time of day? Which is probably due to recent spate of transportation snafu. This too shall pass. #35…Volumes heavier than recent sessions 40 of 85 higher than average for time of day with only 12 greens…Friday's close was weak as well..
Investor day here is a week from Thursday. re 37 – thanks, quarter starting with a little PT it seems, not seeing a lot of credit given to news today. XOP E&P ETF breaking support with demand volume going negative on the daily and intra-day..not expecting support (60.20) to hold. Expecting further testing lower. Zman, you got any thoughts on Genie Energy GNE? re 42 – Nope, I'm mostly an upstream / service guy, I stay away from the midstream and anything that looks like a utility, just not my area. Re: 36, I don't understand your point. The link shows Bakken prices seem slightly above WTI and moving slightly upward. Why would that cause Bakken stocks to be down? re 47 – They have been holding 50 cents over, I show them off $2.50 and down $2.00 from WTI today. It's not a big deal, was just musing. It could also be the tiny retreat in oil today. ZTRADE – ZLT – CRZO – adding on group weakness. CRZO – Added to the core position in the ZLT at an average cost of $25.41. A gassy name with a Niobrara twist, substantial leverage, growing oiliness and a strong but not completely filled out hedge position for 2013. This is our first add to the Core postion after taking a starter position in mid January 2013. Recall they posted a big 4Q12 beat in late February with EBITDA margins rising to a new high and commented on a strong Niobrara program. See today's post for gas macro comments. GST is up 14.7% . Maybe a different co. Definitely will be more balanced. Market being drawn back towards acceptance at around 1546-49.So far bulls defending 1553.75 so the range expansion remains a possible scenario. Below 1553.75 the other scenario becomes edge-less to my eye until a pull back below 1536 offers the next high odds buying opportunity. LINE / LNCO has a new presentation out with a new NAV calc, will have a look in a bit. re 56 – I may add another trading position there but am pretty full up at the moment. Thinking they announce a Brown Dense JV later this month. What are you thinking in terms of the chart there. Alternatively, I'm mulling a first entry in COG which I see as a go to name (kind of obvious from the chart) for natural gas longer term. EOX – Took a starter position in this non-operated turning operated Bakken player story at an average cost just under $6.91. See summary thoughts on the name under this ticker on the pull down menu on the site or in comment 57 under today's post. #58….Demand volume on the weekly and monthly now positive…I was seeing this 36 zone as having volume support below. Also, going back to 2002 when SWN has pulled back with the current setup it has been a 77% successful swing swing trade with 2.68 profit factor. I like it when I have volume profile support and a solid shorter price range setup with longer term bullish demand recently going positive. re 60 – thanks much, makes perfect sense. A little greening of the group in progress. A few debt market comments: 1) junk debt still very much "Open for Business" and 2) if you're Goldman Sachs, you can pretty much get around any rule you want to… or get it changed/written to suit you. Good ol' crony capitalism at work. The only cure for this is to put a stake thru the heart of "Too Big To Fail." April 1 (Bloomberg) — A Goldman Sachs Group Inc.
investment unit that specializes in buying high-yield or unrated debt is seeking to raise money through an initial public offering. Goldman Sachs Liberty Harbor Capital LLC, based in New York and organized as a business-development company, filed a preliminary prospectus with the U.S. Securities and Exchange Commission on March 29. The firm has invested about $72.7 million in eight companies since it was initially funded by Goldman Sachs in November, according to the filing. 2010 Dodd-Frank Act’s so-called Volcker Rule limits banks from investing more than 3 percent of their own money in private- equity or hedge funds. Goldman Sachs employees and lawyers met in February 2012 with Federal Reserve Board staff to request that regulators exempt credit funds from the 3 percent limit, according to a summary published by the Fed. The preliminary prospectus said that Goldman Sachs Liberty Harbor Capital was organized as a business development company and funded by Goldman Sachs on Nov. The prospectus doesn’t say how much the fund intends to raise in the offering. Affordable Care Inc., based in Kinston, North Carolina; Dispensing Dynamics International, based in Industry, California; Goodrich Petroleum Corp., based in Houston; Hutchinson Technology Inc., based in Hutchinson, Minnesota; JG Wentworth Inc., based in Radnor, Pennsylvania; Lone Pine Resources Canada Ltd., based in Calgary; Molycorp Inc., based in Greenwood Village, Colorado; Washington Inventory Service, based in San Diego. Rumor going about NFX is seeing talent walk out the door, trying to get some detail. "Newfield is in an uproar at the moment. They have offered voluntary separation packages for everyone in the corporate office and all the commercial folks in the BU's – criteria being 50 and above and 5 years service. Lots of folks are angry and looking and of course the recruiters are out in force. Problem is that it has sent such a negative message that folks are leaving that probably would not have." re 65 – thanks much BOP. If you missed David's uplifting commentary in the Easter Sunday edition of the NYTs, here it is. If you believed his scenario is imminent, you would sell all your stocks today and go find a cave filled with cans of beans and ammo in which to live. I don't think it's imminent… but these are the clouds on the horizon (albeit, still far away) that keep me up at night. re 67 – hmm, always darkest before the dawn. re 69 – I did see some of his stuff come across Twitter yesterday. Future market direction probably lies somewhere between him and Nouriel and the guy CNBC had on awhile ago who's headline said "ignore the fundamental headlines, this rally is different". Sheesh, ugh, etc. re 71 – I've spoke to geologist and guys that frac wells (who know a little bit about putting energy into the ground.). They seem to buy that if you have an unknown fault and a salt water disposal well on top of it you can create a quake. Fraccing is much more of a mixed bag of commentary. I've not heard about a lot of frac related quakes in the Bakken or the Eagle Ford. The Fayetteville has had a series of small ones that centered around a SWD well. I think its one of those topics that is loud but gets no traction at the end of the day. Maybe you see some adjusted practices (they shut down the Fayetteville SWD well and moved disposal to a different area) but I don't think ti'll be a big deal. #75 — this argument assumes you are fracking in the neighborhood of an existing, somewhat active, natural fault. If there's no natural fault in the area, i do not believe that fracking causes any sort of earthquake at the surface that a human being (and most prairie dogs) could feel. Re: Quakes. I think here in California (Monterrey Shale areas) it may be prove top be a bigger development obstacle than anywhere else. RBC noting WTI focused names underperformed Brent focused names despite the sharp narrowing of the WTI-Brent spread last month. Basically saying they see it as good for the Bakken players going forward. We agree and think that tightening along with the tight differential for Bakken crude to WTI will help with mark to market season adjustments and go forward thinking for the Bakken Players list in general. We'd add that given the wider spread of late which has helped with desirability of US exports it would stand to reason that some of the refining group attractiveness is beginning to erode. We own no refining group names at this time. Zorg – I like the tightening wedge EOX has moved into. Real news here is probably 45 days out but I would expect it to creep up into the release of the IPs on the first 3 operated wells. #80…Lot's to like from the price graph and some to like with the volume profile as well. It managed to reverse back above the supply line at 6.85 today. You might have have something to do with that….creating chart formations again are we????? re 81 – heh, that's funny, thanks. NFX Rallying on the the thought of new talent?? re 83 – I wouldn't think so, they have always been well thought of in that regard. Also, they were a victim of their own success in the international segment last year. You could see some shareholder activism soon … good assets, good teams, capital constrained but working on that … at some point that should shift. It's on the list of things that I think will rally early this quarter (today not withstanding for all those names) in a sort of reverse window dressing move. re 84 – interesting yield name I do not own, but think Eli does. Have meant to do more work on it. #87 thanks to whoever brought into the light..
Re: 66, 67, Thanks for the heads up, I dumped my NFX overboard to cut my losses. It has been my observation that when company management creates chaos in their employees, it takes a long time to turn the company around. re 90 – hear ya. I am a multi year hold now, not that that should matter at all, and plan to see how the 1Q13 goes for them. Getting on a call, back in a bit. And 2Q13 starts off with a yawn. Not exactly shocking given last week's strive for the record type rally. Z..ever take a look at GNE? re 95 – apologies, but know, not my area. NOG on the tape with an increased borrowing base pr. Was $350 mm, goes to $400 mm. Current balance outstanding is $139 mm. Winner Winner Chicken Dinner Watch: The winner of the ZEB 1Q13 contest goes to Elduque with his pick of GDP, up 78% during the quarter. Congrats El-d, nice call. OEDV will be filing in the morning. They filed this evening but missed the deadline, so they will file an NT K (late filing). and then a 10K , and then they will press release the quarter. As previously noted a number of times, we expect 4Q production to be down sequentially due to the timing of well hookups and we have asked them multiple times if they could include in the press release some color on recent month or current production levels, so we'll be looking for that tomorrow. re 100 – cool but I don't see anything unusual about that. Cramer best turn around story NFX. re 103 – right, definitely cool, just given where they are at it looks like just standard ops, maybe a management visit to a Marellus pad. re 102 – well that's interesting, I'm impressed. and Edward, don't apologize, that's pretty slick. SSN on the tape with a non event press release announcing the have set the conductor casing in the first 4 infill wells at North Stockyard. They do note that 2 will be Bakken wells and 2 will be TFS tests. They are batch drilling each step of the 4 wells so drill to surface casing depth, skid the rig, drill next one to surface casing depth, etc. The expect to begin drilling in 10 days. No update on the ongoing rights offering. Eld – Robry modeling 94 Bcf this week. Seems way high to me, but more power to him. I'm close to 70 Bcf and I thought that was high.